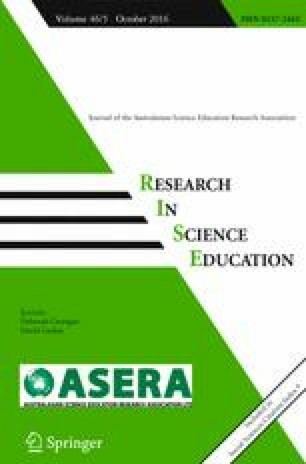 How pre-service teachers (PST) develop pedagogical content knowledge (PCK) during science teacher education is an open research question. Our teacher education module, theoretically based on PCK, specifically combines biology PSTs’ education with high school students’ biology education and includes an innovative role change approach. Altogether, 41 PSTs each participated in three subsequent module days with students (N = 823) from 50 classes. The module’s content dealt with the syllabus topic Genetic Fingerprinting. During participation, the PSTs changed their role by assuming a student’s role on the first day, a tutor’s role on the second day, and a teacher’s role on the third day. By quasi-experimentally administering pre- and delayed posttests, we qualitatively monitored, then content-analytically categorized, and finally quantitatively analyzed three specific PCK components. In contrast to a control group (which did not participate in the module), our treatment preferentially changed the PSTs’ orientations toward teaching biology to a more student-centered orientation (both intra- and inter-group differences with medium effect sizes). Additionally, the PSTs who participated in the three modules days differed before and after module participation in how they addressed potential student learning difficulties and identified potential instructional strategies for avoiding these difficulties. The changes in these PCK components point to a step-by-step development of the PSTs’ PCK. In this process, our participating PSTs assessed the importance of their three roles on the 3 days quite differently; most notably, we found one relationship between the teacher role and the PSTs’ student-centeredness. We specifically discuss the potential and importance of our role change approach within science teacher education. We are thankful to the teachers and students involved in this study for their cooperation. The study was funded by the Bavarian State Ministry of the Environment and Consumer Protection; the Oberfranken Foundation; and the German National Science Foundation (DFG BO 944/4-5). Bavarian Ministry of Education (2011). Education in Bavaria. http://www.km.bayern.de/education-in-bavaria.html (access on August 18, 2014).